Successfully Added Digital Mirror Clock Camera (Motion Detection, 20 Hours Recording Time) to your Shopping Cart. 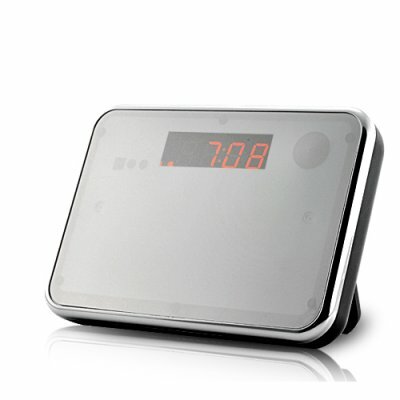 Record clearly and covertly with this Digital Mirror Clock Camera, for ultra long 20 hours continuously on one charge! This Camera appears to be an innocent looking Digital Mirror Clock, but under that mirror there is a secret camera located within its case allowing you to record video as well as audio. The perfectly hidden pinhole lens and microphone make this gadget virtually undetectable. A remote control is also included to trap people more easily. And there is a lot more. This Digital Mirror Clock Camera comes with motion detection activated recording. By setting this mode, it will record only when movement is detected in front of the clock. This is a great function to capture videos you really need, other than to watch hours of useless video footage just to find out the real action. Further more, remember that this Camera can record up to 20 hours on one charge, meaning that you will never have to stop in the middle of a mission just to recharge the camera! New to the business? This is a great device to start with. Put it in your office, the bathroom, or the meeting room, you will be surprised to find out what people are doing behind your back. No software installation, no complicated configuration. Recording is simply just one touch of a button on the included remote control. Also perfect for resale online, this Digital Mirror Clock Camera is now offered at an unbeatable wholesale price. Click “add to cart” now and get your sample within a few days. Brought to you by Chinavasion, your best source for cool gadgets.